LOG LANE VILLAGE — An interesting David-and-Goliath dynamic is taking shape across Colorado’s burgeoning commercial cannabis sector, with tiny communities friendly to the sale of recreational marijuana living in the shadow of large — and totally pot-shop-free — neighbors. Manitou Springs, just a few miles from Colorado Springs, is the only place within a reasonable distance of the state’s second-largest city where you can buy recreational weed. On the Eastern Plains, Log Lane Village plays the same role vis-à-vis Fort Morgan, a city 10 times its size. Garden City, which weighs in at less than 1 square mile, has four recreational pot businesses. On the other side of 25th Street lurks Greeley, with more than 96,000 residents. It has none. The community pairings, in all their strange divergence, are the result of Amendment 64, the pot legalization law passed by Colorado voters three years ago. The groundbreaking measure specifically left it up to individual towns and cities to decide whether marijuana businesses would be allowed. 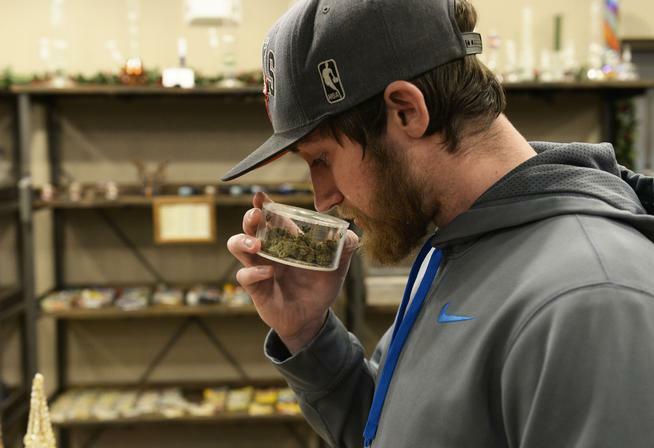 Friday marked the second anniversary of recreational marijuana sales in Colorado. So far, the pot partnership between big and small appears to be working. Crime hasn’t increased appreciably, nor has it had significant spillover effects. Additional sales tax revenues and economic stimulus have given a shot in the arm to the small communities that really need it. And the larger cities, with their more carefully laid-out downtown districts, get to keep their civic brand pot-free and family-friendly. Jerry Garner, Greeley’s chief of police, likens the situation in his city to what existed with liquor half a century ago, when Greeley established itself as a “dry” town and Garden City became the destination for those seeking a stiff drink. “I see a parallel there,” he said. But that doesn’t mean Garner wants to deal with the potential criminal activity associated with what has long been an illegal enterprise. If Garden City is willing take on that burden, he said, that’s up to Garden City. “Marijuana stores are one more criminal target, and frankly, I don’t need one more criminal target,” he said. Yet pot shops as a target for thieves and burglars hasn’t proved to be the problem many feared, according to several law enforcement officials interviewed for this story. Even Garner said he hasn’t seen any evidence that Garden City’s pot shops are nudging up Greeley’s crime stats. Inside Garden City’s tightly drawn borders, police aren’t any busier than they were before pot sales began in 2014, according to Weld County sheriff’s Cpl. Matthew Turner, whose agency provides the city with police services. In Vail, Cmdr. Craig Bettis said the biggest concern regarding recreational marijuana has been consumers — mostly tourists from out of state or from overseas — who smoke it openly, unaware that state law prohibits public consumption of the drug. During the first two years of legal sales, the ski resort town has taken the approach of issuing warnings and educating violators about Colorado’s pot laws — instead of issuing them citations. Allowing pot sales in Vail itself, he said, “would have compounded the issue.” So visitors to Vail seeking legal weed drive just a few miles west on Interstate 70 into unincorporated Eagle County, where several pot shops await. It’s an arrangement that works well for Jill Ryan, a commissioner for Eagle County. Mike Elliott, executive director of the Marijuana Industry Group, said that although the symbiosis between small town and large city may appear to be a win-win for both communities, the places with the most restrictions in place come out at the losing end. Recreational marijuana bans, he said, denote a “head-in-the-sand mentality” that allows the black market in cannabis to flourish while the city forfeits sales tax revenues that could benefit the community. Steve Eby, owner of East Platte Avenue Liquors in Fort Morgan, agrees. In Log Lane Village, with a population of less than 1,000, more than one-quarter of the town’s sales tax revenues comes from its two marijuana shops. Log Lane’s budget will leap from $264,000 this year to $400,000 in 2016. The town already used some of its newfound revenues to repave two blocks. It plans to repave two more blocks in the spring. In Manitou Springs, finance director Rebecca Davis characterized 2015’s 62 percent increase in sales tax revenues over 2014 — from $2.4 million to more than $3.8 million — as “astonishing.” Manitou has two retail marijuana stores. The town 5 miles west of Colorado Springs has allocated $40,000 of that additional money to its road fund and is funding much-needed flood mitigation projects. It also hired a private security company this past summer to patrol its tourist-dependent downtown. Mayor Marc Snyder said the town’s reserve budget has swelled from $160,000 six years ago to $1.6 million in 2015. “It’s been an incredible shot in the arm for Manitou,” he said. In Garden City, nearly 43 percent of the $1.06 million the town collected in sales tax revenues in fiscal 2014 — $451,808 — came from retail cannabis. Garden City has used some of the new money to revitalize Eighth Avenue with new street scaping, to expand Town Hall and to purchase a town vehicle. The benefits aren’t just limited to increased sales tax revenues, said Lisa Pearson, manager of Green Stop in Log Lane Village. 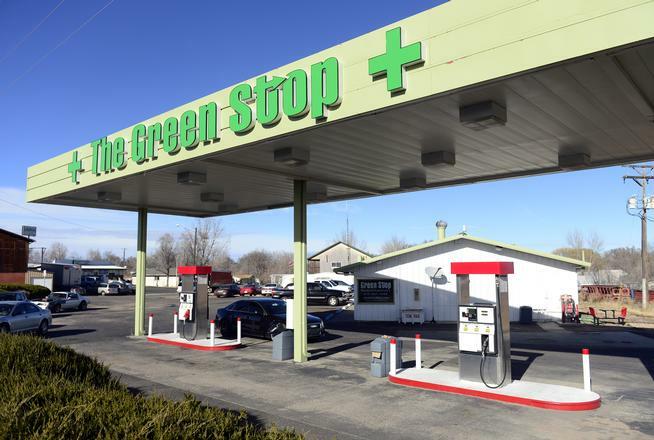 She said the improvements Green Stop has made to its building at the corner of Maine Street and Colorado 144 since it opened 15 months ago have encouraged at least one other business to locate in town. Dave Sanders, a manager at Ruffrano’s Hell’s Kitchen Pizza in Manitou Springs, said business has definitely gone up since the recreational marijuana shops opened at the east end of town. Many of his new customers are tourists, seeking a New York pie to go with their Colorado high. The business opportunities from the world of legal pot can spread to neighboring communities. Linda Allen runs Js!, a “weed-friendly” overnight accommodation in Greeley that she lists on home rental site Airbnb. She credits her proximity to Garden City and its pot shops for her ability to run a viable business in a city that doesn’t permit pot sales. “If they don’t have some place to buy it, they aren’t going to come,” Allen said. Jeff Wells, city manager for Fort Morgan, conceded that the city’s restaurants see extra business from those riding Interstate 76 and popping into Log Lane Village for marijuana. They find no place in the small town to eat. Chapin, Vail’s mayor, said forgoing tax revenue is never an easy decision for any community, and the Town Council made the topic a “major part of the discussion” before deciding to outlaw pot shops. The driving force behind the ban, Chapin said, was the recognition that protection of Vail’s brand as a worldwide ski vacation destination had to be paramount. Colorado Springs Mayor John Suthers said his city, which allows medical marijuana businesses, had to consider the strong military presence in the Springs and what kind of impact legal recreational pot sales could have on that image and those relationships. Kevin Hawes, who owns Unique Embroidery and Engraving in Fort Morgan, said he couldn’t be happier that there aren’t any marijuana shops alongside his store on Main Street. Fort Morgan’s residents sent a “fairly overwhelming message” through three public hearings and three public forums that they didn’t want pot shops in town, Wells said. The City Council listened, he said. Even in the smaller towns that do allow them, the cannabis industry isn’t given complete free rein. Either a cap has been put in place or buffer zones limit how many storefronts there can be. Manitou Springs made sure that its two stores — the maximum for the town of 5,200 — were more than a mile from the tourist-trodden downtown district. “We said from the beginning that we can’t let (recreational pot) define us — we can’t let this jeopardize our bread and butter, which is our historic downtown,” Snyder said.